The National Debt, Who’s To Blame? There’s a lot of blame going on these days regarding the recent budget deficits and huge national debt. Who is responsible? According to the GOP, it’s Obama’s reckless spending. According to the Democrats, it’s because of Bush’s fiscal irresponsibility and the recession. Who is telling the truth? 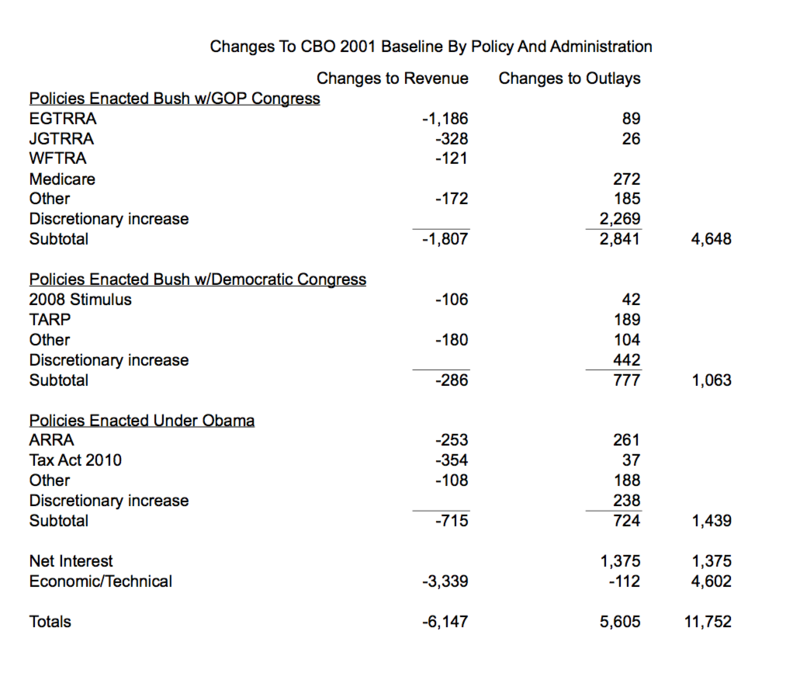 Thanks to the CBO, we can estimate who contributed what to the debt between 2001-2011. Based on these calculations, it appears that most of the increase in the national debt since 2001 is the result of policy changes enacted under Geroge W. Bush during his first 6 years and the two recessions experienced since 2001. Obama’s spending has added $724B, while his tax cuts have added an additional $715B, for a total of $1,439B – or 12% of the total added above the 2001 baseline.